Slide-in design makes graphic changes quick & easy! Standard 17" x 11" size ads can be printed right off many business printers! Black expanded PVC backer can have custom vinyl lettering applied at a sign shop for a more permanent message! Non-glare lenses protect signage while ensuring your message is easy to read! This metal sign frame is the ultimate in affordable, effective convenience. 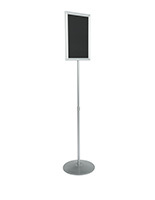 The simple design and neutral silver finish make this a suitable display for most any environment. 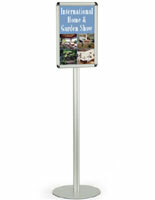 This poster holder, metal sign frame is designed to hold 17" x 11" landscape-orientation signage. 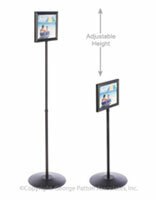 Businesses across all industries will find this adjusting stand to be very useful. 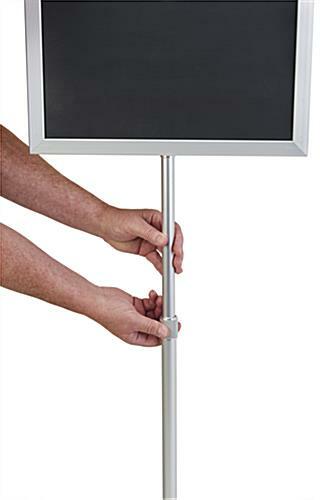 Restaurants can display menus, hotels or business lobbies can use the metal sign frame to hold a directory or simple messages, such as 'Conference Being Held in Ballroom'. The weighted metal base helps to keep this poster stand from tipping over due to incidental contact. 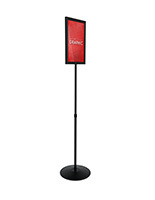 Retail stores use the metal sign frame to promote products or advertise sale or clearance events. Many business printers can print 11" x17" advertisements, so you can change messages as often as needed without having to custom order graphics. 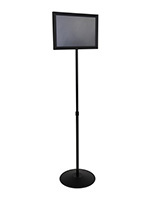 This metal sign frame, also known as a metal poster holder, features a telescoping, 1" diameter pole, so your sign can be displayed at heights varying between 40" and 63" (to top of metal frame). 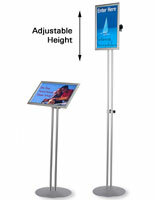 The double-sided fixture features a slide-in design so your message, poster, or graphics can be changed in just seconds. 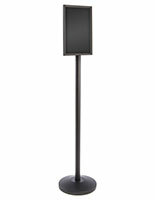 A 1/4" thick black expanded PVC backer and (2) non-glare lenses are included with the metal sign frame, as well. Simply insert your graphic between the backer and a non-glare lens, so your message is viewable from all angles. The backer could also be brought to your local sign shop to have custom vinyl lettering applied for a more permanent display. 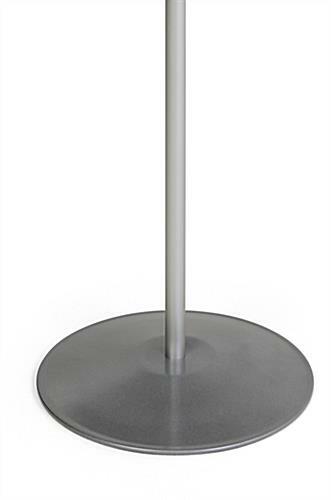 The metal sign frame is constructed from aluminum with a satin silver finish. Ships unassembled; one person assembly takes just minutes. Instructions and hardware are included. Please Note: Although this is an 17" x 11" metal sign frame, please allow 1/2" on each side of your poster or advertisement to be covered by the metal frame. Please Note: These signs should not be placed under direct sunlight for long periods of time and when in storage they should not be stored in extreme heat conditions. Just the right size! 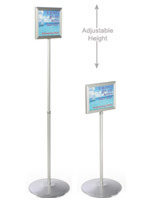 Good quality ledger-sized sign holder for the right price! This is a great sign that will be able to be used in a multitude of ways. We're glad you're satisfied with the sign stand, Christine! These stands are study and easy to use. The telescopic pole is great for storage purposes. Thanks for taking the time to review, Drew! We're glad you're satisfied with your purchase. I've purchased several of these (the first time through another website). We were so pleased, that we ordered more, directly from Displays2Go. Our department copier makes great ledger sized signs, and we needed a way to get these out easily to our events/classes. Finding something that would take this sized sheet, was portable, and fairly easy to change out was not easy. These holders do the job admirably. We are a desert facility, and even in the shade it can get very warm. We did have a problem with the inserts warping (they do warn you about heat). We were able to purchase pre-cut foamcore boards (which are more heat stable) and use those in place of the provided inserts and 11"x17" clear plastic sheets to use as replacement lenses - blowing sand makes the lenses not very attractive after some time. All in all, we have been pleased with this purchase. The stand works well, but the clear insert has a very noticeable texture on one side, which makes it not completely clear. Any sign you print looks blurry behind the insert. I'm going to try a few workarounds, but removing the insert isn't a perfect solution since the thickness of the insert is part of what keeps the sign pressed neatly against the frame. We are sorry that you had some issues with your order, Dane. A customer service representative will reach out to you promptly.